Arab allowed to throw Jewish farmers off land he claims – but isn’t the legal owner when it comes to making a sale. A Jewish family in the Hevron region that stands to lose years of work after an Arab man laid claim to some of its farmland has accused Israel’s legal authorities of taking a double approach to Arab claims of land ownership. However, despite their vehement objections, the Supreme Court ruled that the Deutsch family must destroy its greenhouses located on the land in question. What makes the case truly absurd, Mordechai Deutsch says, is that according to the court the Arab “owner” is considered the owner when it comes to expelling Jews from the property – but not when it comes to anything else. “Let’s say I want to buy the land from the Arab who claims this is his land – I can’t, because he isn’t the owner. But in order to kick me out, he is the owner?” he said. “Sometimes I feel like I’m being accused of not stretching my neck out enough to let them slaughter me,” he added. 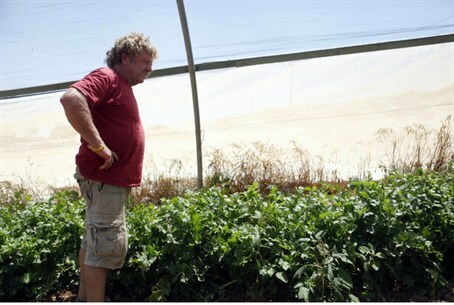 The decision to demolish the family's greenhouses comes on top of another blow - the government's decision earlier this year to free the terrorist who murdered Yeshayahu Deutsch, Mordechai's brother, as part of a "gesture" to the Palestinian Authority. Deutsch was speaking to MK Ayelet Shaked (Bayit Yehudi), who toured the area Wednesday. His wife Michal agreed that Israeli authorities are operating on a double standard. “Why is it that there are demolition orders against Arab villages in the area, but they aren’t carried out, but the orders against us are? It’s only because we’re Jews,” she accused. The Supreme Court ruled in 2011, in a decision by then-Chief Justice Dorit Beinisch, that any land in Judea and Samaria (Shomron) that is not owned by the state is, by definition, privately owned land. The ruling means Israeli homes may be destroyed for being on “private Arab land” even when no individual Arab can prove ownership, and there is no evidence that the land was used or cultivated in the past by anyone other than its Israeli residents. MK Shaked expressed outrage at the Deutsch family’s plight. “The fact that Jewish farmers can be thrown from their lands with no evidence and no proper trial, in our days, is suitable to a dictatorship, not an enlightened democracy,” she said. Shaked also met with regional council head Tzviki Bar Chai, who told her that the Deutsch family’s troubles are not an isolated event. The State Prosecution has brought multiple cases in recent years “that aim to take land from Jews that they have been cultivating for several years,” he said.